The Battle of Vincennes was a battle of the American Revolutionary War fought on February 23 – February 25, 1779 when a small force of American soldiers led by George Rogers Clark encircled Fort Sackville at Vincennes, Indiana and continued marching around it until the Indians and British garrisoned there were convinced that there were hundreds of soldiers. The Indians fled leaving about 150 British soldiers under the command of Lieutenant Governor Henry Hamilton. Clark sent a flag of truce asking for Hamilton's surrender. He refused Hamilton's terms however, and had two captured Indians killed in front of the Fort with a tomahawk which caused Hamilton to acquiesce and surrender on Clark's terms. Clark was able to achieve the advantage of surprise by making an 18 day march from Kaskaskia through flooded and freezing terrain. The actual number of attackers and defenders varies considerably from source to source. The version presented by the United States National Park Service numbers Clark's contingent at approximately 170 Americans and Frenchmen. Other sources number Clark's forces at 47 men. Hamilton is said to have released his troops for the winter, and his garrison "now consisted of approximately 40 British soldiers and a similar number of French volunteers and militia from Detroit and Vincennes." With Frenchmen among both the attackers and defenders, the appetite for a battle may have been diminished. After Hamilton's surrender, he was taken to Virginia where he was imprisoned by Thomas Jefferson. After his release in 1781, Hamiltion served "as the Governor of Quebec and later as Governor of the Island Colonies of Bermuda and Dominica". 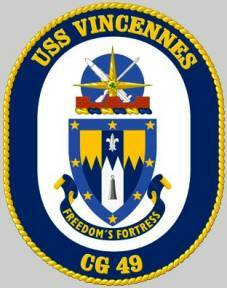 The fourth USS Vincennes (CG-49) is a U.S. Navy Ticonderoga class AEGIS guided missile cruiser. In 1988, the ship shot down Iran Air Flight 655 over the Persian Gulf, killing all 290 civilian passengers onboard including 38 non-Iranians and 66 children. The ship was launched 14 April 1984 and sponsored by Marilyn Quayle, wife of Indiana Senator Dan Quayle. The Vincennes was named for the Battle of Vincennes during the Revolutionary War, while the previous Vincennes heavy cruiser and Vincennes light cruiser were named for the city of Vincennes, Indiana. She was commissioned at Pascagoula 6 July 1985, Captain George N. Gee in command. The ship carries guided missiles, rapid-fire cannons, and two Seahawk LAMPS helicopters for anti-submarine and anti-ship warfare, personnel transfers, and other purposes. The Vincennes was the first of the Ticonderoga-class cruisers to enter the Pacific Fleet. Upon commissioning in 1985, Vincennes helped test the SM-2 Block II surface-to-air missile. In May 1986, Vincennes participated in the multinational exercise RIMPAC 86, coordinating the anti-aircraft warfare efforts of two aircraft carriers and more than 40 ships from five nations. 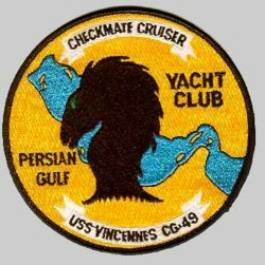 The Vincennes was deployed in August 1986 to the Western Pacific and Indian Oceans, a first for a Ticonderoga- cruiser. The ship served as anti-air warfare commander with the Carl Vinson and New Jersey battle groups, operated with the Japan Maritime Self-Defense Force and the Royal Australian Navy, and steamed more than 46,000 miles (74,000 km) in waters from the Bering Sea to the Indian Ocean. During the Iran and Iraq war the United States took active measures in the Gulf to protect shipping, mainly oil tankers, that were being threatened by both countries. On 14 April 1988, the guided missile frigate USS Samuel B. Roberts (FFG-58) hit a mine in the Persian Gulf during Operation Earnest Will. 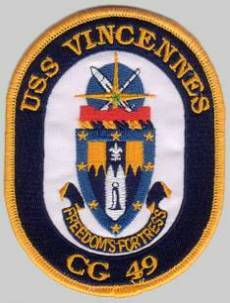 Six days later, Vincennes was yanked from Fleet Exercise 88-1, sent back to San Diego, California and told to prepare for a six-month deployment. 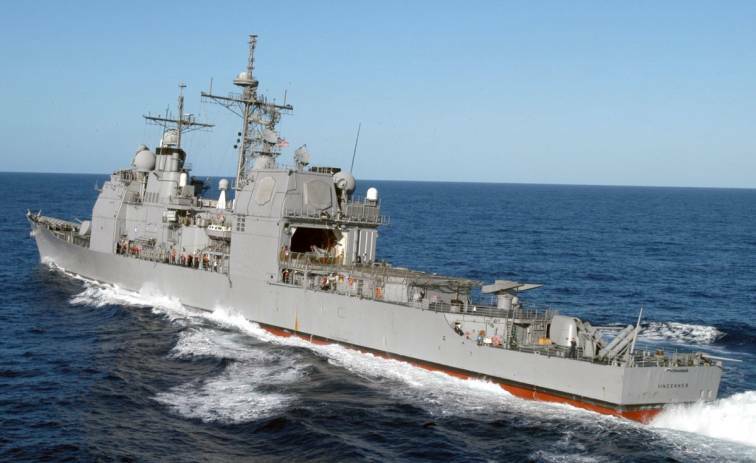 The reason for the haste: Navy leaders decided that they needed an Aegis ship to protect the exit of the damaged Roberts through the Strait of Hormuz. One month later, the cruiser entered the Gulf, and in early July, stood guard in the Strait as the damaged frigate was borne out on the Mighty Servant 2 heavy-lift ship. The ship made 14 Hormuz transits during its Earnest Will operations. On 3 July 1988, Vincennes, under the command of Captain William C. Rogers III, shot down an Iran Air Airbus A300B2 over the Strait of Hormuz, killing all 290 aboard. According to the US government, the crew mistakenly identified the Iranian airbus as an attacking F-14 Tomcat fighter. However, the Iranian government has maintained that the Vincennes knowingly shot down a civilian aircraft. In February 1990, Vincennes was deployed on a third six-month tour of the western Pacific and Indian oceans, with SH-60 helicopters from HSL-45 Det 13. The ship coordinated all battle group air events and served as the command-and-control flagship during Harpoon-Ex-90. In July 1990, Vincennes returned home after steaming nearly 100,000 miles (160,000 km). In August 1991, Vincennes departed for a fourth western Pacific deployment. Steaming with Independence, Vincennes performed duties as the anti-air warfare commander for Battle Group Delta until detaching to participate as the United States representative in MERCUBEX 91, a joint United States and Singaporean exercise. Over the next three months, Vincennes participated in the bilateral exercise Valiant Blitz with the South Korean Navy, the bilateral exercise Annualex 03G with the Japanese Maritime Self Defense Force, and ASWEX 92-1K with the South Korean Navy before reaching Hong Kong to act as the U.S. representative for the Navy Days ceremonies. Vincennes returned from deployment on 21 December 1991. 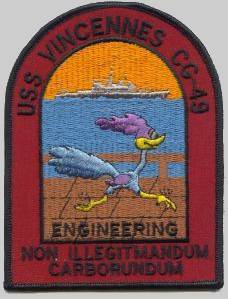 In June 1994, Vincennes departed on a fifth western Pacific deployment with the Kitty Hawk Battle Group. 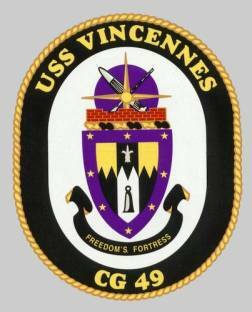 Vincennes performed duties as anti-air warfare commander for the battle group. During deployment, Vincennes conducted an anti-submarine exercise, PASSEX 94-2, with the Japan Maritime Self-Defense Force, the bilateral exercise MERCUB 94-2, a joint U.S. and Singaporean Navy exercise of the Malaysian peninsula, the bilateral exercise Keen Edge, with the Japan Maritime Self-Defense Force, and Tandem Thrust, a larger-scale joint exercise which Vincennes participated as the area air defense coordinator for the entire joint operating area. 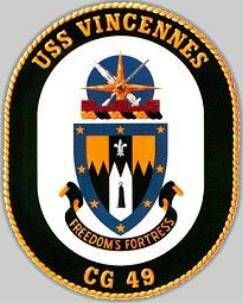 Vincennes returned from this deployment on 22 December 1994. 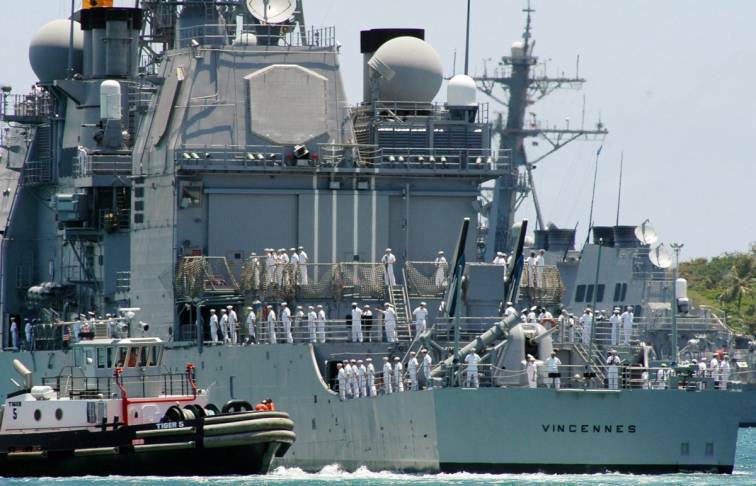 In August 1997, Vincennes changed homeport from San Diego to Yokosuka, Japan, then steamed to the South Pacific and took part in Exercise Valiant Usher 98-1 with the Belleau Wood amphibious ready group and the Royal Australian Navy destroyer Perth. The combined exercise took place near Townsend Island, Australia. Vincennes also took part in the U.S. Seventh Fleet's Fleet Battle Experiment Delta (FBE-D) from 24 October to 2 November 1998, in conjunction with exercise Foal Eagle, a regularly scheduled exercise that simulates the defense of the Republic of Korea. Sponsored by the Navy Warfare Development Command, FBE-D was the fourth in a series of experiments that tested new combat systems and procedures at sea. On 12 August 2000, Vincennes completed Sharem 134, a bilateral exercise with several Japanese ships and other U.S. participants. The exercise included a week of undersea warfare training and data collection in the South China Sea. The ship tested its submarine detection, sonar range testing, and sonobuoy employment and developed new submarine prosecution procedures. 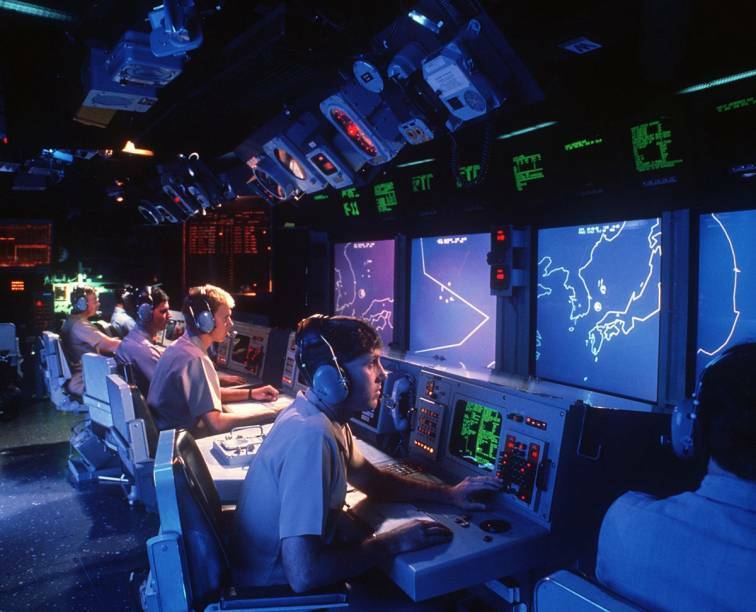 The final Sharem events included a "freeplay", which allowed the cruiser to detect and prosecute other submarines, combining many of the tactics and systems tested during Sharem. In mid-November 2000, the cruiser fired missile batteries at remote-controlled aerial drones provided by Fleet Activities Okinawa during MISSILEX 01-1. On 23 March 2001, Vincennes, as part of the Kitty Hawk Battle Group, cruised into Changi Naval Base, the first time a U.S. carrier had moored pierside in Singapore. 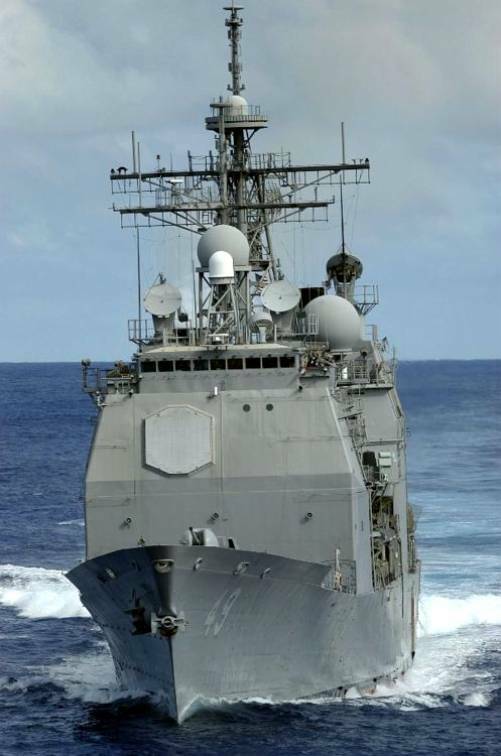 The Vincennes took part in a 23 August-27, 2001, military training exercise called Multi-Sail, which was designed to provide U.S. and Japanese forces interoperability training in multiple warfare areas. 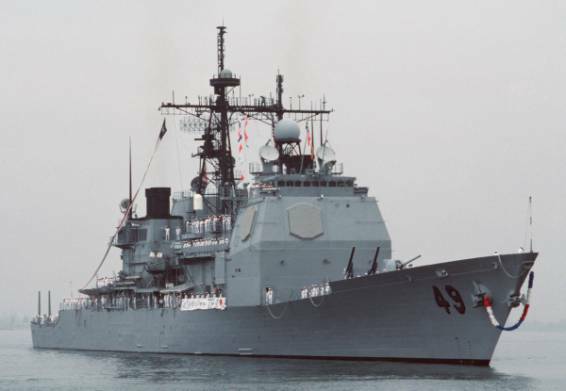 The Vincennes departed from Yokosuka on 17 September 2001, to conduct operations in support of Operation Enduring Freedom, and the ship returned on 18 December 2001 after more than three months at sea. 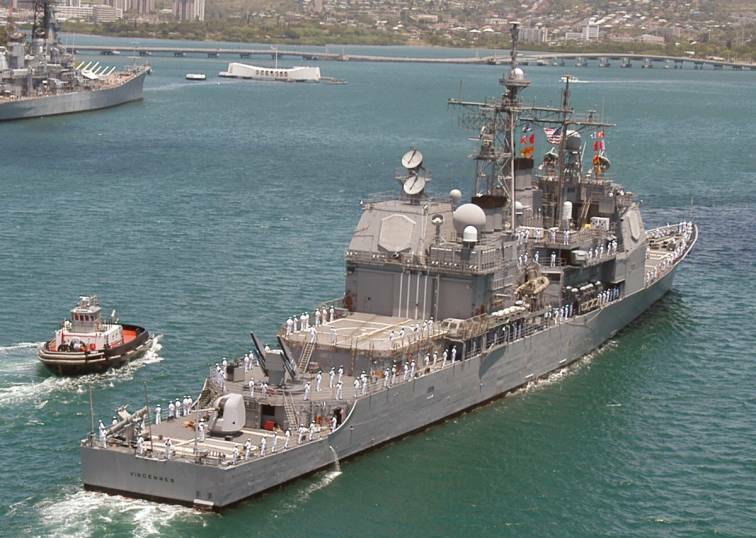 The Vincennes was decommissioned on 29 June 2005 at San Diego and stricken the same date. She is presently mothballed at the Naval Inactive Ship Maintenance Facility in Naval Base Kitsap, which is located in Bremerton, Washington. As of 2008 she is slated for scrapping in the next five years along with her sisters Thomas S. Gates and Yorktown. The Vincennes has been awarded the Navy Meritorious Unit Commendation, the Battle Efficiency "E" three times, the Combat Action Ribbon, the National Defense Medal, and the Sea Service Deployment Ribbon with four stars.